Could You Be Suffering From High Frequency Hearing Loss? Your family members may have told you that they are concerned about your hearing. You may even have shrugged off their worries because your hearing problems “come and go.” You might have no trouble hearing the television, but repeatedly ask young children to repeat themselves. If you notice a difference in your hearing with different sounds, people, and environments, you could be suffering from high frequency hearing loss. Losing the ability to hear high frequencies is a common early side effect of hearing loss. People are diagnosed with high frequency hearing loss if they are unable to hear sounds between 2,000 Hz and 8,000 Hz, which is measured on an audiogram. For example, deep voices and booming audio are heard at low frequencies, while birds tweeting and female voices are heard at high frequencies. Symptoms. 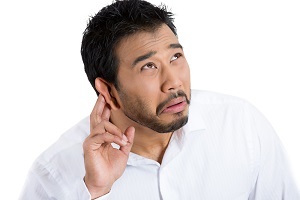 As there are a wide range of speech sounds that occupy high frequencies, people who suffer from this type of hearing loss often struggle to understand or keep up with daily conversations. They may miss consonants in higher registers, such as the letters F, H, and S. Female voices may be more difficult to hear or to differentiate from others’ in conversation. Speech often sounds slurred or muffled, especially when talking on the telephone. High frequency hearing loss at young ages can significantly impact a child’s ability to learn and communicate, leading to developmental delays. For this reason, it is vital that children have their hearing tested regularly to ensure that their speech and language skills are not impaired. Causes. Aging, noise exposure, and medical conditions are the three biggest causes of high frequency hearing loss, all of which damage the sensory cells in the inner ear. The ear is able to process high-frequency sounds through tiny hair cells in the lower part of the cochlea. These hairs absorb and translate noises into electrical impulses which are sent to your brain, which then interprets the impulses as sound. If the sensory cells in your cochlea are damaged, you lose the ability to hear and ultimately process these sounds. As the hair cells that perceive low-frequency sounds are located near the top of the cochlea, hearing loss typically occurs at higher frequencies first. Treatments. The most effective treatment for high frequency hearing loss is hearing aid therapy. A hearing aid has the ability to amplify the high-pitched sounds that the wearer has difficulty perceiving, allowing him or her to understand speech noises more effectively. Some hearing aids even offer different settings for conversations and directional microphones, allowing the wearer to move effortlessly between talking in groups, on the phone, or one-on-one. Prevention. There are many easy and inexpensive things people can do to reduce the likelihood of hearing loss at any age. One of the best ways to prevent hearing damage is to use hearing protection (such as ear plugs or approved over-the-ear protection) whenever they are exposed to noises over 85 decibels (dB). Any excessively noisy activities have the ability to damage hearing, including the use of power tools, riding a motorcycle, shooting firearms, or attending concerts and sporting events. In addition, you can protect your hearing by keeping the volume turned down on televisions, stereos, and personal electronic devices. As more and more young people are suffering from early-onset hearing loss, it is more important than ever to have regular hearing screening tests. Our audiologists and hearing care staff can perform painless exams to determine the cause and extent of your hearing loss, and can get you started on the road to treatment immediately. Contact us today to schedule your hearing screening! I Think I Have Hearing Loss. What Do I Do About It?